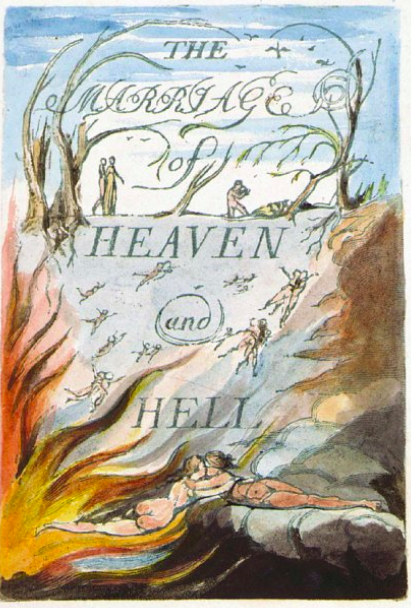 the human predicament: The Marriage of Heaven and Hell: Why Does Seattle Invest in Fossil Fuels and Private Equity? 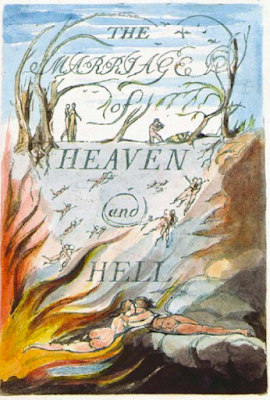 The Marriage of Heaven and Hell: Why Does Seattle Invest in Fossil Fuels and Private Equity? During the last decade, the City of Seattle and its Retirement System have invested hundreds of millions of dollars with financial advisers who insisted they could “beat the market,” that is, they could outperform the S&P 500, the Vanguard Total Bond Index, etc. Well, the chickens are coming home to roost. The chart below displays the actual market value of the Retirement System’s holdings from 2006-2016 (the lower line on the graph), as well as what the market value of the Retirement Fund would have been over this same period if the Retirement Board had invested in a portfolio of low-cost index funds with the same risk profile as the Fund's own portfolio (the upper line on the graph). 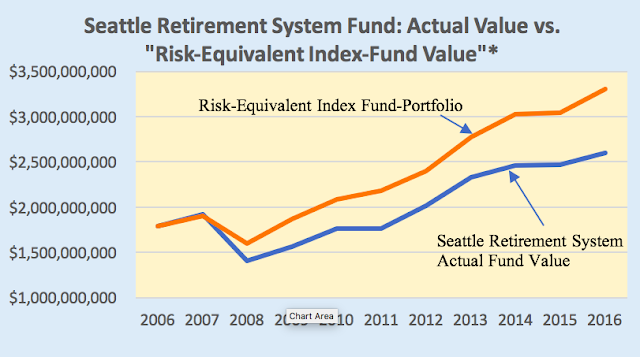 At the end of 2016, the actual value of the City’s retirement fund was about $2.5 billion, whereas the fund’s value would have been about $3.3 billion had Seattle invested in index funds with a similar risk profile over this period. And, yes, most of this $0.8 billion difference would now be available to the City, which could prudently reduce its contributions to the Retirement System to fund low-cost housing, bike paths, police training, and so on. *See (endnote ) for details. Regrettably, the disquieting results shown in the chart could have been easily avoided if the Retirement Board had been paying attention to the main argument put forward by its outside attorney in defending the Board’s recent rejection of proposals calling for the liquidation of the Retirement System’s fossil fuel holdings. On April 11, 2017, then Seattle Mayor Ed Murray sent a letter to Seattle’s Retirement Board recommending that the Board immediately liquidate all its holdings in companies involved in “the mining or burning of coal,” and “re-evaluate its position about the role fossil fuels play in our retirement fund and how they impact the health of our retirees” (see endnote [ii]). On July 13, 2017, then City Council-member and Chair of the Seattle Retirement System’s Board, Tim Burgess, responded to the Mayor’s plea for divestiture by claiming that “fossil fuel divestment” would have a negative impact on the Retirement System’s “investment portfolio and should not be pursued.”(see endnote [iii]). Rather than publicly debating the issues at stake, the City’s Retirement Board stood meekly behind its outside counsel, who said, “the U.S. Supreme Court has reaffirmed that it is generally ‘implausible’ for a fiduciary [e.g., the Seattle Retirement Board] to believe that a retirement plan committee can predict the value of a publicly-traded company better than the financial markets.” ([See endnote iv]). The legal brief supporting the Board’s position relies heavily on the so-called “efficient markets view,” which holds that a company’s current stock price is the best indication of its fundamental value. According to this view, it would be absurd to think that an environmental group’s opinion about the future value of a fossil fuel company could be a more reliable indicator than its current market price. Of course, the same argument applies to the Seattle Retirement Board itself. There’s no reason to believe that the Board’s judgment about a company’s fundamental value is a better indicator than its current market price. Actually, Seattle’s Retirement Board doesn’t really believe this at all. If they did, they wouldn’t spend millions of dollars every year for investment advice that, according to this same “efficient markets view,” is essentially worthless. Professor Eugene Fama, whose work on Efficient Market Theory won a Nobel Prize in Economics in 2013, summarized the upshot of his research this way: “it’s impossible to pick people who can beat the market" (see endnote [v]). In fact, Professor Fama’s claim is entirely consistent with the Seattle Retirement System’s own experience. Although the Retirement System has invested hundreds of millions of dollars with financial advisors who claimed they could “beat the market,” Seattle’s actual returns, net of fees, have fallen well short of the net returns accruing to low-cost index funds with similar risk profiles. (See the chart above). Hubris has played a significant role in this tragedy. To begin with, the Retirement Board assumes an average return of 7.5%/year, which might have been reasonable when Treasury Bonds were paying 5.5%/year. Achieving this target requires a lot more risk-taking when Bonds are only paying 2.5%/year. Generating high investment returns is further complicated by the recent rise in pension fund activism in Seattle, in particular the emergence of environmental groups demanding climate-friendly investments and more transparency. Unfortunately, the difficulty in searching for higher returns within a progressive political environment has pushed the Seattle City Employees’ Retirement System beyond the boundaries of intelligent and transparent investing. Instead of initiating a comprehensive public review of the Retirement System’s investment objectives and performance, the Retirement Board decided to quadruple its commitment to private equity, a high-risk asset class that has underperformed the Retirement System’s own private equity benchmark by 15%/year between 2007-2016. Although private equity has produced high returns for a few exceptional investors such as the Yale University Endowment Fund, the Seattle Retirement System has not been one of these investors. Between 2009-2016, the Retirement System earned -2.6%/year on its private equity investments, a dismal result compared to the Retirement System’s own 12.7%/year benchmark return for private equity, and one that has cost the City more than $100,000,000. (The performance of the Seattle Retirement System’s private equity holdings can be found here, at the top of page 18). 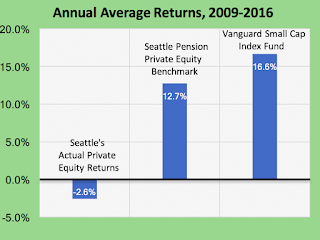 The chart below displays the annual average returns for Seattle’s private equity holdings, Seattle’s benchmark index for private equity, and Vanguard’s (higher risk/higher return) Small Cap Growth Index Fund. Some readers may recall from the 2012 election that the special tax loopholes granted to private equity allow Mitt Romney (Bain Capital) to pay a lower tax rate than the average Seattle worker. Well, there's very little doubt that some of the fees Seattle pays to its private equity partners finds its way to The American Investment Council, which lobbies Congress in support of the most inequality-enhancing tax policies now under consideration (see here). Before this despicable marriage could be consummated, however, City officials were told that if Seattle wanted to hook up with the very best private equity managers, then the City would have to find a way to keep these dealings secret. And, yet, neither the Mayor nor any member of Seattle's progressive City Council was willing to speak out against this ransom demand. Instead, Seattle lobbied the State Legislature to grant the City the right to deny any public information requests concerning the investment performance, fees, and charges of Seattle’s private equity partners (see endnote [vi]). If you're a Seattle citizen and not extremely cynical, you may find this hard to believe. Well, try sending a public disclosure request to the Seattle Retirement System asking how much they pay in fees and charges to each of their private equity partners. [i] You can find the Retirement System's 4th quarter 2016 performance here. SCERS reports a 10-year annual average return of 4.1% (gross of fees) for the period ending 6/30/2017. The S&P Total Market Index can be found here, and the Vanguard Total Bond Market - Institutional Investors can be found here. Ten year annual average returns for a range of index funds, as well as for Seattle’s Retirement System, are displayed below. Vanguard total market excluding U.S.
*As of 12/31/2016, Seattle’s asset allocation was 60% equity, 26% bonds, 14% real estate and other. Applying this same asset allocation to three of the index funds above – 60% total market index, 26% Vanguard total bond index, and 14% Vanguard REIT Index Fund – results in an annual average of 7.48%/year compared to the Seattle Retirement System’s return of 4.58%/year over this 10-year period. [ii]. Seattle Mayor Murray’s letter can be found here. [iii]. Seattle City Councilmember and Retirement Board Chair Tim Burgess’s Press Release can be found here. [v]. A description of the Efficient Markets theory and an interview with its creator, Eugene Fama, can be found here.